Background: Several previous investigations have determined potential risk factors for stress fractures in athletes and military personnel. 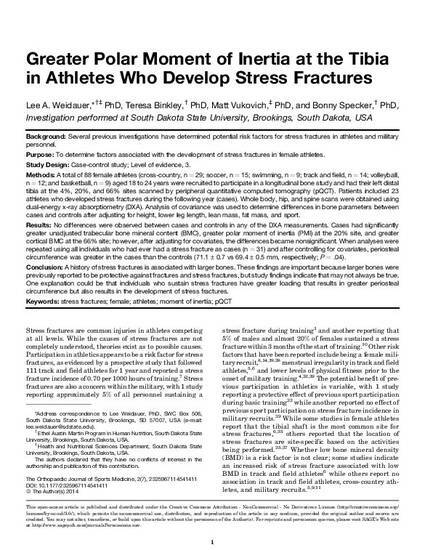 Purpose: To determine factors associated with the development of stress fractures in female athletes. Study Design: Case-control study; Level of evidence, 3. Methods: A total of 88 female athletes (cross-country, n ¼ 29; soccer, n ¼ 15; swimming, n ¼ 9; track and field, n ¼ 14; volleyball, n ¼ 12; and basketball, n ¼ 9) aged 18 to 24 years were recruited to participate in a longitudinal bone study and had their left distal tibia at the 4%, 20%, and 66% sites scanned by peripheral quantitative computed tomography (pQCT). Patients included 23 athletes who developed stress fractures during the following year (cases). Whole body, hip, and spine scans were obtained using dual-energy x-ray absorptiometry (DXA). Analysis of covariance was used to determine differences in bone parameters between cases and controls after adjusting for height, lower leg length, lean mass, fat mass, and sport. Results: No differences were observed between cases and controls in any of the DXA measurements. Cases had significantly greater unadjusted trabecular bone mineral content (BMC), greater polar moment of inertia (PMI) at the 20% site, and greater cortical BMC at the 66% site; however, after adjusting for covariates, the differences became nonsignificant. When analyses were repeated using all individuals who had ever had a stress fracture as cases (n ¼ 31) and after controlling for covariates, periosteal circumference was greater in the cases than the controls (71.1 ± 0.7 vs 69.4 ± 0.5 mm, respectively; P ¼ .04). Conclusion: A history of stress fractures is associated with larger bones. These findings are important because larger bones were previously reported to be protective against fractures and stress fractures, but study findings indicate that may not always be true. One explanation could be that individuals who sustain stress fractures have greater loading that results in greater periosteal circumference but also results in the development of stress fractures.